Quitting an app on Windows is easier than doing so on a Mac. On Windows all you need to do is click on that red X sign. But on a Mac the red button only closes the application window. You need to manually quit the app. There are multiple ways to quit an app on a Mac, so if you do not feel comfortable with one way, you can use another. 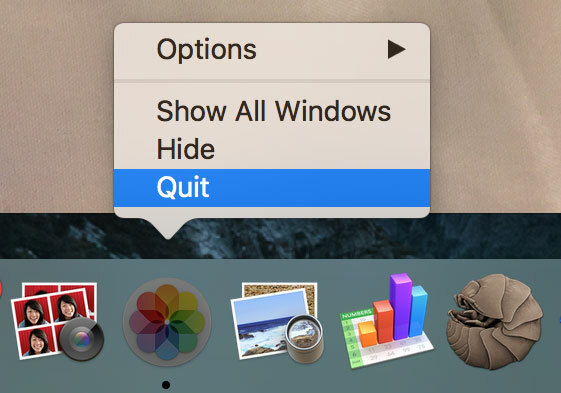 Here are the six ways you can use to quit an app on a Mac. 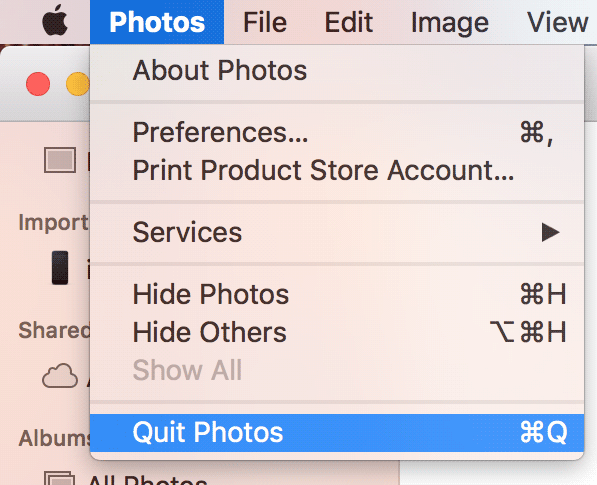 Note: I will be quitting the Photos app in the following methods. This one is quite common, and you are probably using it now. Almost every app on your Mac has a menu in the menu bar (on the top of the screen) where you can control the app’s various functions. In that menu bar is an option labeled as your app name. For example, if you have opened the Photos app, you should see the “Photos” menu next to the Apple logo on your menu bar. Clicking on that menu and selecting the “Quit” option lets you exit out of that app. It is as simple as that. When you launch an app on your Mac, it shows up in the Dock at the bottom of your screen. You can also quit an app there by selecting the option. Just right-click on the app you wish to quit in your Dock, select the option that says “Quit” and the app will be closed. Mac also provides you with a shortcut key to quit an app on your Mac. First, you need to ensure that you are inside the app you wish to quit. Then, press the “Command + Q” shortcut key, and the app will be closed. This one is the fastest way to quit an app, as you only need to press two buttons. There are some apps that only reside in the Menu Bar and do not appear anywhere else like the normal apps. For those apps you need to select them from the Menu Bar, and click on the appropriate option to close them. 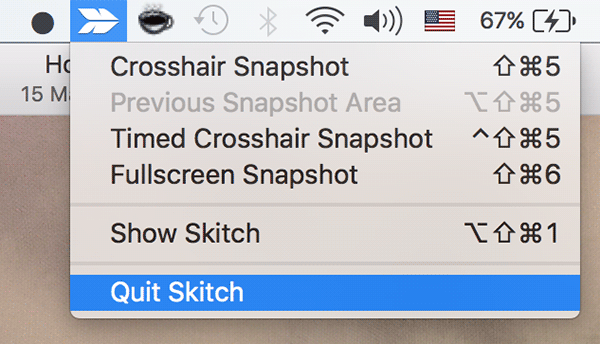 In the above example I have closed an app named Skitch from the Menu Bar by clicking on it in the Menu Bar and selecting the option “Quit Skitch.” You can do this with all of your apps. Activity Monitor tracks all of the activities and resources used on your machine. While it provides you with various information about the apps running on your Mac, it also offers you the option to quit an app. Launch Activity Monitor on your Mac, double-click on the app you wish to quit, click on the “Quit” button on the screen, and then click on “Quit” again. If you would like to use a command to quit an app, then you can do so using the built-in Terminal app on your Mac. Launch Terminal on your Mac, type in the following command replacing APP-NAME with the name of the app and press Enter. As soon as the above command is executed, the app will be closed. Those are the six ways you can quit an app on your Mac. Let us know what method you found to be the most comfortable for you. There’s also `killall`, which is a lot easier to use than the `osascript` method: `killall APP-NAME`. If you know the process ID (PID) of a process you can also use `kill PID`. There are lots of options for quitting or killing a process with these commands – you can run `man killall` or `man kill` for more info.